(91outcomes.com) – There’s been a lot of current discussion about the possible long-term health hazards associated with burn pits in the current wars in Iraq and Afghanistan. However, just like PTSD and TBI, burn pits have been a part of military life for far longer than they and their long-term effects of them have been recognized as issues. During the 1991 Gulf War, in addition to large burn pits, outdoor latrines were common for the hundreds of thousands of troops stationed in the desert and burning the waste was often a daily task -- and an unpleasant event both for those tasked to do the burning and those who came in contact with the acrid smoke and fumes. 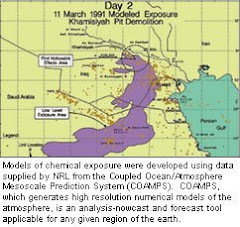 These inhalation, ingestion, ocular, and skin hazards have had little study in the 20 years following the end of the 1991 Gulf War. PHOTO: Gulf War U.S. Army soldier, SPC Tim Cornelison, of Cincinatti, Ohio, burning feces. Cornelison, a member of B Battery, 6-27 Field Artillery based out of Ft. Sill, Okla., was attached to the 18th Airborne Corps during the military buildup that began 20 years ago next month and resulted in the Persian Gulf War several months later. 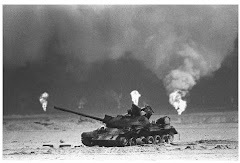 In this photo taken at his unit’s encampment in the northern Saudi Arabia desert during Operation Desert Shield late in 1990, just weeks before the war began, fumes and smoke rise above several cans of diesel fuel used to burn the feces after carefully stirring fuel and waste together – often with a long-handled shovel like this one – in order to ensure complete burning after the mix is ignited. A wooden field latrine is at left, with angled urination tubes visible directly behind the latrine. The base of the latrine is open, allowing for access to the half-barrels left underneath to capture the waste. A tent, Humvees, and desert camouflage are in the background. Photo courtesy of Tim Cornelison, all rights reserved. Thanks Anthony! I really appreciate your publishing my photo. I wish I had more of the horrors that we witnessed there, but that was definately one of them. I was probably an expert at this and probably spent 3-4 days a week at this chore! Although NCO's had to supervise, E-4 and below are the ones who had to do this dirty job and we definately choked down alot of smelly fumes dealing with this daily. While it only required 4-5 hours to do this job daily, it definately affected my breathing and overall health. Thanks again for the article!